Brinton Lake Dermatology specializes in the recognition, prevention and management of all types of skin cancer. 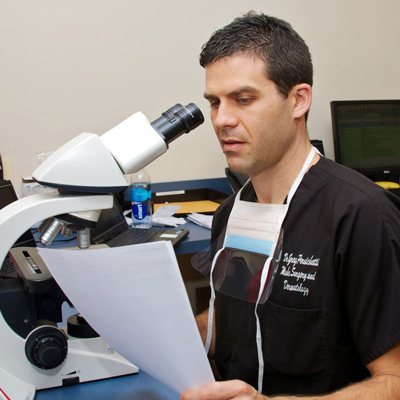 Our fellowship-trained Mohs and reconstructive surgeon, Dr. Greg Persichetti, performs Mohs micrographic surgery in our state-of-the-art surgical suite. Skin cancer, according to the American Academy of Dermatology, is the most common form of cancer in the world. Last year, more than two million cases were diagnosed in the United States. The good news is that most types of skin cancer, if caught early and removed, have a high cure rate. One of the most effective means of treating skin cancer is via “Mohs” surgery, named after Dr. Frederic E. Mohs, who established this technique. Patients who require this specialized, micrographic (viewed through microscope) surgery will no longer have to travel to a different office to obtain this advanced treatment. Brinton Lake Dermatology is proud to offer an advanced Mohs surgical suite under the direction of Dr. Gregory B. Persichetti a board-certified dermatologist and fellowship-trained Mohs surgeon/reconstructive specialist who is a part of our professional team. Mohs surgery treats skin cancer through a highly specialized, precise technique that removes the cancer in stages as deemed necessary, one tissue layer at a time. This procedure offers the maximum removal of cancer with minimum damage to the surrounding healthy tissue, as well as the smallest incision possible for better healing and cosmetic results. For certain types of skin cancer in certain locations of the body, Mohs surgery offers the highest potential for cure. Most Mohs surgeries are covered under health insurance plans. To learn more about Mohs surgery, visit the American College of Mohs Surgery website and watch their information video here. Mohs micrographic surgery is a state-of-the-art treatment for skin cancer in which the Mohs surgeon precisely removes the skin cancer, examines the skin tissue microscopically, and, once the skin cancer is completely removed, reconstructs the skin defect. Mohs surgery is a procedure that maps out the diseased tissue and confirms microscopically that the skin cancer has been cleared from the surrounding normal tissue. Immediate on-site microscopic examinations of the tumor allows the Mohs surgeon to see beyond what is visible to the naked eye, to precisely identify the diseased tissue and to remove only the diseased tissue. Once the tumor is cleared, fellowship-trained Mohs surgeons have extensive training in reconstructive surgery and are generally able to perform the reconstructive surgery immediately after microscopic analysis confirms that the cancer is completely removed. Mohs micrographic surgery and reconstructive surgery is usually performed on an outpatient basis, in one day, under local anesthesia. The healing process is similar to that of most skin surgical procedures. Of all treatments for skin cancer, Mohs micrographic surgery offers the highest cure rate for skin cancers with minimal discomfort and the greatest preservation of normal tissue, thereby minimizing scarring. On rare occasions, a referral to a plastic surgeon will be recommended. Should this be necessary, our office will arrange for the referral within a few days of the Mohs surgery. Dr. Persichetti and the Brinton Lake Dermatology team understand that you may have many questions about this procedure. For more information or to set up a consultation, contact Brinton Lake Dermatology at 484-785-DERM (3376) and ask to speak with the Mohs surgery scheduling coordinator.